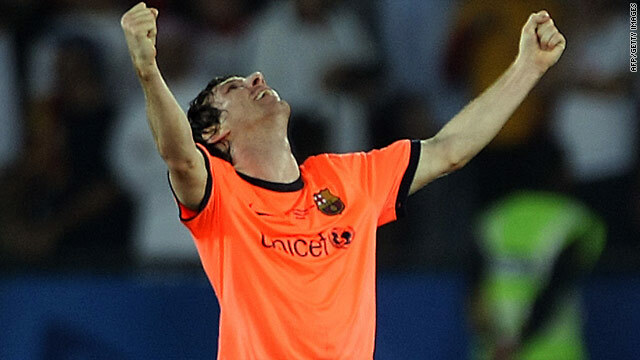 Barcelona forward Lionel Messi celebrates his winning goal in the final of the Club World Cup. (CNN) -- Lionel Messi scored an extra-time winner as Barcelona came from behind to beat Estudiantes 2-1 in the Club World Cup final on Saturday to confirm the Spanish and European champions as the top team on the planet. Argentina star Messi sunk his compatriots, the South American champions, as he chested in a cross from Daniel Alves with 10 minutes left in Abu Dhabi. Estudiantes took a shock lead against the run of play eight minutes before halftime when Mauro Boselli beat Barcelona fullback Eric Abidal to a left-wing cross from Juan Manuel Diaz to head home. Barcelona poured forward in search of an equalizer, with Europe's player of the year Messi denied by goalkeeper Damian Albil after a mazy run that saw him beat four opposition players. The Catalan giants finally leveled with just a minute of regulation time left, as defender Gerard Pique -- who had been thrust into a more attacking role -- set up substitute Pedro for a header into the net. The young winger followed up his goal in the 3-1 semifinal victory against Atlante, which made him the first player to score in six different competitions in a single calendar year. Barcelona dominated in extra-time and it was no surprise when Messi pounced with an opportunist effort in the 110th minute to give Barcelona their first title in the event, having lost 1-0 to Internacional in the final three years ago. Asian champions Pohang Steelers claimed third place after beating Mexico's Atlante 4-3 on penalties after the match finished 1-1 following extra-time. Kim Hyun-Gil scored the winning spot-kick after Song Dong-Jin saved Rafael Marquez's effort and Horacio Peralta hit the post. Marquez had scored a minute after halftime to cancel out Denilson's opener three minutes before the interval. Barcelona's Spanish league lead was reduced to two points as second-placed Real Madrid hammered struggling Zaragoza 6-0 on Saturday. Gonzalo Higuain and Rafael van der Vaart both scored twice in the first half, while Cristiano Ronaldo and substitute Karim Benzema netted after the break. Third-placed Sevilla failed to keep in touch with the leaders, losing 2-1 at home to Getafe, while Athletic Bilbao moved up to sixth with a 2-0 victory over Osasuna. In Germany, Bayer Leverkusen returned to the top of the Bundesliga with a 3-2 win at home to Borussia Moenchengladbach. Schalke are a point back in second after Friday's 1-0 win over Mainz, while Bayern Munich are two off the leading pace in third following a 5-2 crushing of bottom club Hertha Berlin. Borussia Dortmund climbed to fourth with a 1-0 victory at home to Freiburg. French champions Bordeaux went eight points clear with a 4-1 win at home to Lorient as nearest rivals Marseille, who have played one fewer match, drew 0-0 at St Etienne.